Today I have no photographs to offer, not because I did not run all over Amsterdam, but because I lack a mini-USB cable and there is no picture editor in the hostel's computer to resize them. The aluminum keyboard is partially stuck, it looks as if someone had tried to bend it on his knee in a rush of drunken manliness: please take a minute to consider that it takes twice as much effort to type each and every single letter on this post! I shall include photos as soon as I get home. Today we are going to do things a little differently. All I am going to do is to give you five small, funny snippets from the hottest city in the Netherlands, instead of going on humanistic rants on the zeitgeist of a nation –we will have time for that later- and tons of pictures! 1. The frickin' cars: it is no secret that the Dutch, given their geography, have very limited means of transportation, mainly bikes and trains, given the huge expense that owning a car in the Netherlands means. And it's not like everything is not close by, cities like Amsterdam can be easily walked through without worries of getting lost or not seeing enough. 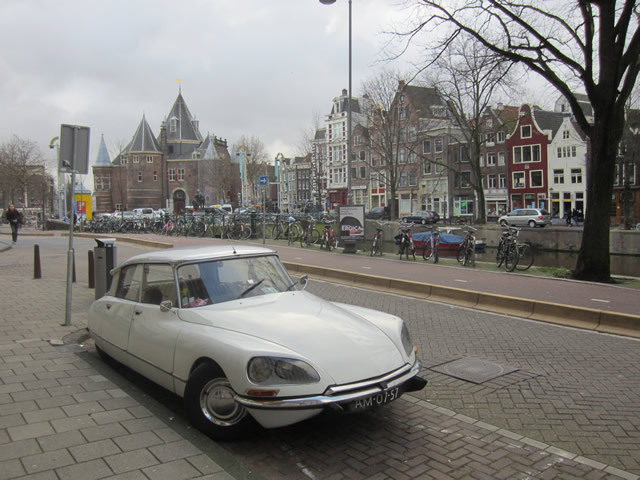 My special mention here goes for the automotive rarities in the nation: from the newest model Mercedes E-Class taxis, to the heaps of old Citroën DS sharks lumbering next to the historical canals. The chances of seeing any European rarities (Citroën H truck, Aston Martins, old Porsches and 80's Mercedes) are far greater than in any other park of Europe. Sheer passion for cars? Cheap mechanics? Extravagant lifestyles? You tell me! The old Citorën DS Sharks were everywhere! In wagon and ambulance version, too! 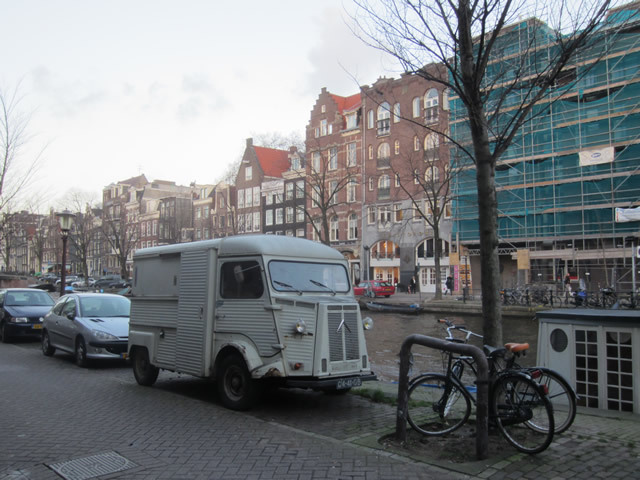 Citroën H van, next to a canal in Amsterdam. Road trip time! 2. Po(s)tcard: the hilarious sight of a couple of tourists in a Coffee Shop (hole-in-the-wall space dedicated to the sale and consumption of Cannabis), wrapped in the haze and the strong smell of pot, with mouths hanging open, staring into the distance. Much like a modern-day bropium hall, surrounded by (do not miss this) waffle stores and other restaurants selling rich foods for when the munchies kick in. I do not smoke, but I still have to try some brownies. 3. Meat market: the Red Light District is one of the few places on the Earth were prostitution is regulated like any other job. These fine ladies pose in provocative garments in rooms exposed to the street. The waits for customers can get long, so they have tall stools to rest on; it's funny to look at in the sense that these people just look so bored and uninspired, texting on their cell phone, taking a puff or even reading a book. I do like women with brains, but the selection available ranged between burned-out classics to unattractive youngtimers, many of them from exotic locations. 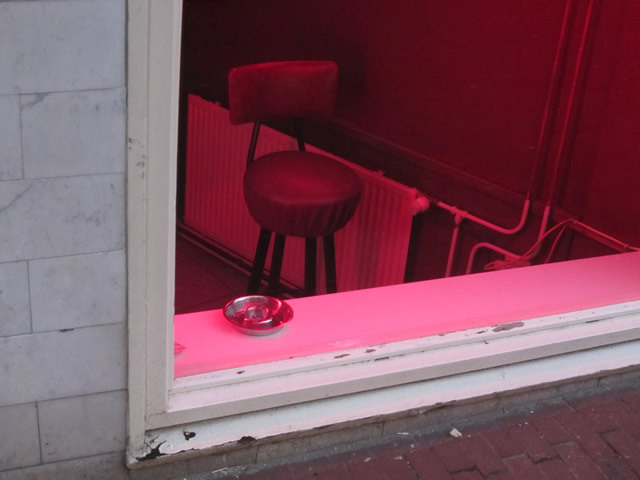 The priceless part of the Red Light District is the people who navigate such rarified neighborhood: from packs of youngsters accompanying someone who is soon to be a man, to highly surprised Japanese tourists, and sketchy, fast-walking men with shaved heads and some white designer garment. Worthy of a visit, just for laughs! You know, no big deal. Just sitting here with an good ol' cigarette. 4. Hoards of Spaniards: yes, you heard it well, hoards of Spaniards. Massive amounts of them, in couples or numerous groups, all destined to getting stoned out of their minds when the endless fun of the homeland doesn't quite cut it anymore. From people fainting just ahead of me as I walk peacefully by one of the Centraal Canals, to loud references to Spanish humor, to some rootless individual sitting next to me, on Skype, repeating in a high, clear tone, the words "Skinny Dipping" for at least six or seven times, each one slower than the last. Even the receptionist was from Spain, but thankfully she spoke perfect English while I chewed my words like a good Kansas cowboy. Whoops, she just left the computer rather indignantly! 5. Turkish delight: after eating a delicious mixture of bread crumbs, diced lamb, thick tomato sauce and yogurt followed by an exemplary dish of Baklava, the waiter at the Turkish restaurant could not but notice the California driver's license attached to my debit card. A great conversation ensued. We talked about gas prices (1.4 euros a LITER over here), traveling the US on a shoestring budget, and how much he wanted the Mustang from Gone in Sixty Seconds. Well, "Won't get fooled again" started playing right now in the lounge next door, so I guess that is my musical queue to put my sunglasses on, and leave triumphantly after this most wonderful day, to meet three very picturesque Mercedes enthusiasts tomorrow. My jealousy knows no bounds. Salute!